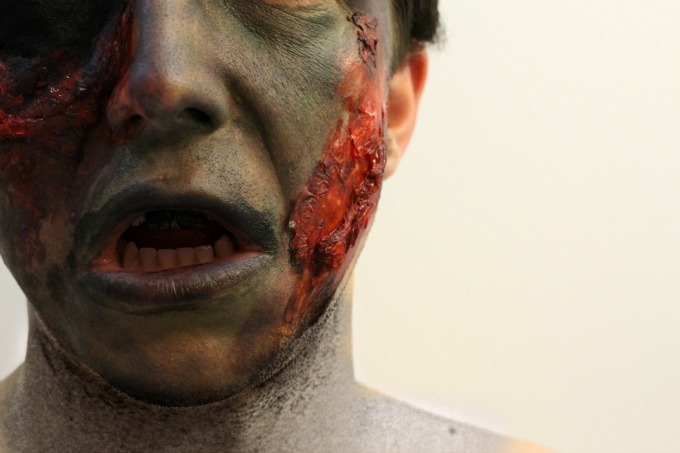 For my last Halloween post of the year (except of course for my birthday post) I’ve let my boyfriend run free with the Face Paints and Halloween makeup kit from Party Delights and of course he had to create something gruesome like this. I’m actually really impressed with it, he’s used his imagination way more than I thought he ever could for this look and it’s actually turned out pretty darn good! 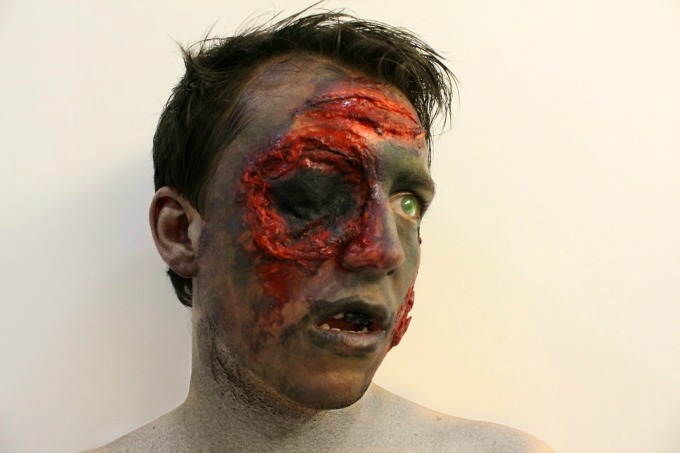 To create this look Jordan first used white tissue paper by ripping up small pieces and then gluing them to his face using PVA glue mixed with fake blood. 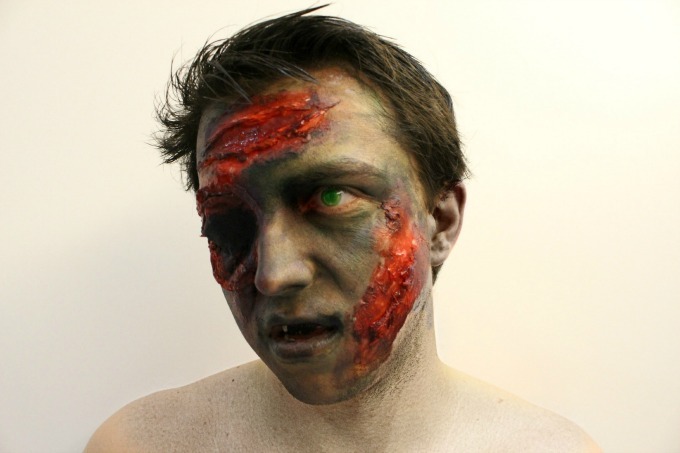 He only glued around the edges as to keep the tissue in the centre clean ready to cut through and fill with blood, making it look like a fresh flesh wound and then using the liquid latex from the Zombie Makeup Kit* he made the wounds look a little more natural and gory! 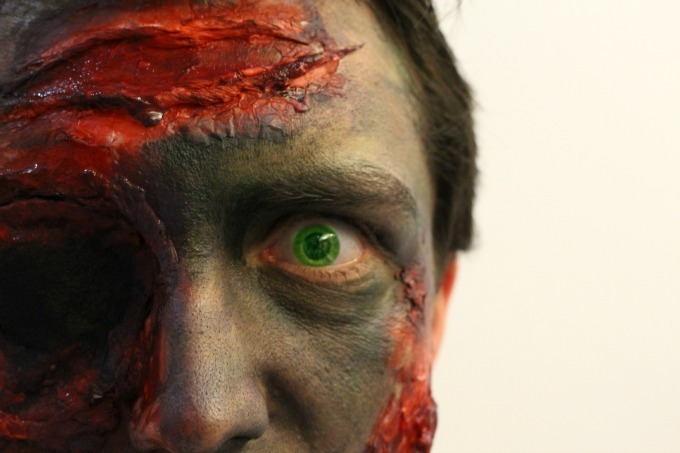 To create the ‘black hole’ eye he started off by wetting an oval cotton pad and wiping it across the black Snazaroo face paint* and then gluing it around the edges to his eyebrow bone and under eye with the PVA glue and fake blood mix. The rest is just face paint cleverly sponged on, black lipstick, fake blood and a little Zombie eye magic from PicMonkey (that bit was me). It’s such a good look and I can’t wait to see him do this again for halloween!